The Christmas Valley 1 & 2 neighborhoods both showed positive notes in 2018 when compared to 2017. The median and average sale prices both increased as did the median dollar per square foot for the homes sold. There were 17 properties sold in Christmas Valley 1 and the same exact amount in Christmas Valley 2. The list to sale price stayed about the same in Christmas Valley 1 and it decreased in the Christmas Valley 2 area. The table below shows the market statistics that we follow for 2017 and 2018. "It had been a 30 year dream to move to South Lake Tahoe. 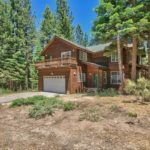 While in Tahoe on vacation we contacted Dylan Hastings with Pinnacle Real Estate Group and shared with him what we were looking for in a home. Dylan instantly told us of a home that he felt fit our wishes. He immediately made arrangements and showed us the home along with several other homes. Dylan was right the first home he showed us was exactly what we were looking for. Dylan worked... continued"